Project settings control general settings and preferences for StaffMap projects. See the table below to learn more about each project property. Select 'Project Settings' from the list of tools. Select which properties you would like to enable or customize. (See table below for more information). Project Theme Select from one of StaffMap's preloaded theme packages to style your project. 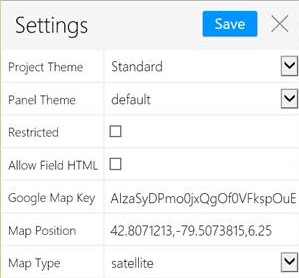 Panel Theme Select from one of StaffMap's preloaded theme packages to apply to your panels. Restricted Check this option to enable the log in portal displayed before the project is made visible to users. Allow Field HTML Allow HTML in fields on the Employee form and within name panels. Copy the longitude and latitude from the URL (after the @) as you browse a map. Alternatively, right click a location and select What's Here? A popup will open displaying the longitude and latitude.